I personally have a love-hate relationship with lunges. I enjoy using it as a transitional move, but to linger and hang out there requires some much needed deep breathing on my part. In a warm up sequence, lunges are sometimes used simply as a transitional move like moving from Forward Fold to Down Dog, or from Plank or Down Dog to Forward Folds or Warrior poses. However, lunges are so much more than your standard transitional move or typical hamstring and groin stretch. Most of us know that lunges work the leg muscles as well as the hips. However, did you know that you can spice up a simple lunge to improve flexibility and strength in other areas such as the abs, the arms, and even your chest? Begin by stepping one leg forward, bending the knee so that the knee is over the ankle at a 90-degree-angle, or modify the bend to a 45-degree-angle. Extend the back leg straight back or modify the lunge by resting the back knee on the mat. Elongate the spine and try to avoid leaning forward. Instead of placing your hands on either side of your feet, try interlacing your fingers and placing them on your bent thigh. Now you’re working on balance by engaging your core. Feels a little different, doesn’t it? Begin in a Low Forward Lunge with the back leg extended straight back. Then begin to twist the torso towards the leg that is lunged forward. Bend the back knee and reach for the foot or ankle with the opposite hand. When I want to open my entire front body, I add this twist. This variation will open your chest, and if you don’t rush it and you can explore a nice gentle back bend invigorating the entire body. Begin by standing in a wide stance with toes forward, push hips back and squat to one side keeping the squatting knee bent over the toes. Either rest the hands on floor or extend the arms out to the side to test your balance. As you fire up the core, you will lessen the weight you feel on the bent leg. Begin in Low Forward Lunge and gently lower the forearms down to the mat, or modify by resting the forearms on blocks. This lunge variation will challenge you to lift up out of your shoulders—ultimately strengthening arms and your shoulders. So the next time you’re using a lunge to link poses, or you’re thinking about incorporating lunges into your yoga flow, don’t forget that lunges don’t have to be boring. 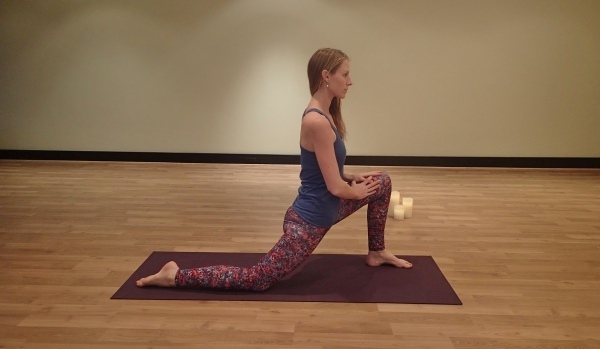 Explore these yoga lunge variations to energize the entire body in more ways than one!